My own skepticism has caused me to hesitate sharing this experience, because when I hear people share their own experiences and draw what I consider to be specious conclusions, I fear that’s how people will perceive the lessons I learned one morning a few weeks ago. When returned missionaries come home and declare that they were good missionaries and kept the commandments, therefore they got engaged within a month of returning home; or when people assume everyone in an entire region of the world was wicked therefore a catastrophe leveled the land, I tend to wince a little. So what I’m about to share may prove a little hypocritical, but the Lord’s judgment is just and for me and me alone; nevertheless I’m willing to face judgment from my spiritual peers and superiors in mortality. Or just not care. I’m fine either way now. It was a Tuesday night, and I decided to go to bed early, because I had to take my mom to the airport at 3:30 Wednesday morning. She came up to attend my graduation ceremony for library school and had stayed with us for a full six days. The car I usually drive had a flat tire, so we planned to take the other car instead. I headed to bed around 9:00 or 9:30, which would have given me a solid 6 to 6.5 hours of sleep. In order to sleep, one has to be sleepy, which I wasn’t. I can’t even recall that I was all that tired. I lay in bed and tossed and turned. Every half hour or so I looked at the clock, which gratefully seemed to be creeping along. I played a few rounds of sudoku on the Kindle and read a few pages of The Screwtape Letters. I tried lying on my stomach and then on my back and then on my side. I turned the pillow when it got too warm. I attempted breathing exercises to help relaxation. Nothing worked. My mind was too active thinking about driving to the airport and potty training Z and work and everything else I could possibly think about. Reilly said if I was too worried about being too tired on the road, we’d get the whole family in the car. But I didn’t want him to be too tired for work. I told myself I’d be fine. Time went from crawling to running, and around 3:00am I finally dozed off to half-consciousness. My alarm went off at 3:20am. Reilly got up to scrape any ice from the car windows, which there was none. I threw on some jeans and a sweater, then my winter coat. I grabbed a Mountain Dew from the refrigerator. Mom and I climbed into the car. The ride to the airport was uneventful. I pulled into the dropoff area and helped Mom with her suitcase. We hugged each other. I cried a little. After watching Mom walk into the terminal, I got back into the car. Just as I had pulled away from the dropoff area and driven onto the road exiting the airport, the check engine light came on. A bright yellow-orange light shaped like a drawing of an engine. I still had 40 miles to get home. Sometimes the engine sounded fine. I don’t know anything about cars, but sporadically the engine sounded as if it was losing traction, like it lost its grip on a thingy but another thingy would keep spinning for 5 to 10 seconds until it gained traction again. This happened every few miles the whole way home. Whenever this happened my stomach sank, and I would experiment with pressure on the gas pedal and vary speeds to see if that affected the traction thingy. The traction thingy happened no matter what I did. Yet I decided to drive slower than the speed limit most of the way; I don’t know why. The whole time I watched the speedometer and the temperature gauges, and the check engine light stayed on. The whole time, my mind was alert, and I came up with an emergency plan in case the car stopped on the freeway. The whole time my mind was spinning, with and without traction, much like the engine seemed to be. The whole time I was driving I was praying aloud. I turned off the radio so I could hear the engine, but also so that the Lord knew I was serious about needing to get home. There are worse situations than being stuck on the side of the freeway at 4:30am, but I wanted to get home. I made this desire known. I talked about my family and my attitude and my current level of spirituality. I apologized for not praying as much and reading my scriptures as much. I started making those deals that people make about being a better person if they survive a certain situation. I expressed gratitude for blessings, for being able to drop off my mom safely at the airport. The distance home shrank and I steered onto our exit. I asked and hoped that the car would make it to our apartment on the slower city roads and at stop lights. Soon I was just a few miles away. I pulled up to our apartment and parked the car. When I turned off the ignition, the check engine light also shut off. I sighed with relief. Reilly was up when I walked in. I told him about the car. It wouldn’t be until the following Sunday when Reilly’s dad would look at it to see if anything was wrong. But it occurred to me: What if nothing was wrong with the car after getting home? What if this was just a thing that happened to keep me awake on the way home from the airport? What if the check engine light turning on was all in my head? If nothing was wrong with the car, it might look like I was just telling stories, for what, attention? Thankfully, something was wrong with the coil thingy in the engine. Yes, it’s a bummer, but I’m also glad I wasn’t imagining it. Reilly said that if I had been worried about staying awake on the drive from the airport, the car issue and the check engine light had definitely kept me from falling asleep at the wheel. A blessing in a slightly conspicuous disguise. I’m grateful the situation compelled me to utter a 35-minute prayer on the freeway in the wee morning hours. The act of praying aloud also had kept me awake. But what if I had gotten a good night’s sleep? Chances are that the car would have still acted up, and my mind would have still been put on high alert, and I still would have made it home safely. I’d still have something to be grateful for. Instead of a prayer of desperation, I offer a prayer of gratitude for the check engine light, for the reminders of temporariness of this life, the awareness of struggles in this world, the assurance that–even when we feel we’re losing traction, and I’m just now realizing the analogy of this situation and forthcoming bad pun–exaltation will come to this mortal coil. Every night before bedtime we gather together to pray as a family. It’s the end of Z’s bedtime routine, and it’s something we’ve done since she was a newborn. We do this to help her develop the habit of praying and instilling the value of praying together as a family. As I’ve mentioned before, our daughter talks, but there’s not much that her father nor I understand yet. She laughs and squeals, and her jabbering has the certain cadence and melody of sentences. After we set Z down in her crib, Reilly and I reenacted this scene a few more times, imitating our dear daughter. We laughed, again and again. What a precious moment. This is probably my favorite time of the day. Sheets cover the lower half of my body. The nearby freeway hums and rumbles in the background. Light from streetlamps sneaks through closed blinds and diffuse the darkness. Turned toward the center of the bed, I watch; I listen. I realize I’m not breathing, not because I’m consciously holding my breath, but because of the little one beside me. Little lungs inspiring as deeply as they can, relaxed eyelids, the muted and peaceful glow of her face siphon happiness from places within I never knew and fill my heart that I’m still getting to know. There’s tightness, discomfort from contentedness. It is solid ground and a highwire. I teeter along the cognitive dissonance where happiness and doubt coexist. The first eight weeks cast an easily darker shadow on my perspective. I couldn’t ignore hormones and just smile. I couldn’t ignore harmless comments or even generous offers of help and instead took offense. I couldn’t ignore persistent, pulsing cries pleading for simple needs to be met. I couldn’t help myself. Objectively, months later levels are more even. There’s more smiling, fewer eggshells. We use the bathroom. We eat. We sleep. Fulfilling these needs reveals the complexity of her personality, the obvious need to be nurtured, guided, taught. Is it Maslowesque. Is it even a pyramid. What am I doing. Is it good enough. Will it ever be good enough. I allow myself to inhale her overwhelming beauty, her skin aubergine, opalescent in the wee hours. I continue watching her as the bedroom slowly brightens. The air conditioner and refrigerator harmonize in my subconscious, but her breathing completes the chord and finally lulls me to sleep. It’s good enough for now. There are still shadows, though fainter. They do not come from her. This past month has found so many of you in the hospital. I have a friend who gave birth at the beginning of the month to a baby boy with HLHS. He recently underwent surgery and seems to be doing well. If he’s as determined and courageous and faithful as his mom, he’ll do just fine. You can follow their journey here. A couple weeks ago, one of my best friends from high school was feeling some odd sensations in her chest and went to the ER to have it checked out, just in case. She found out that she had a heart attack and would be staying in the hospital to have a coronary spontaneous dissection monitored. She’s home now and seems to be doing much better. Then some of you have checked into the hospital with chest pain or fevers or respiratory issues or brain surgery. Some time ago one of you went in for spine surgery. Someone I know is undergoing chemotherapy and may have had her kidney removed. Some of you have been in accidents and are going through rehab. Some of you still need a flu shot. My dad has a weak heart and dementia and won’t take his medicine, though from what I hear, he likes where he’s staying right now. Mom and my brother seem especially susceptible to pneumonia and bronchitis, respectively. And mom’s husband still seems to be recovering from knee surgery he had a while back. And there are lots of friends who have delivered babies or are due within the next few months. Some of them have experienced post-partum depression. Some of them work really hard to meet the needs of their families. Some of them are struggling a lot with motherhood in general. There are some whose afflictions I don’t know anything about at all. But I think about you. I’m here if you need a listening ear. And I pray for all of you. One early morning in January, May went to the lab to undergo a three-hour glucose screening. Workers at the lab had instructed her to fast for 10-12 hours and only drink water. They told her to bring something to do because she would be at the lab building for about three and a half hours. Since the lab opened at 7:15am she stopped eating around 6:45 the previous evening. She made sure to drink lots of water, though she’d already drunk half a gallon during the day. Even though she wanted to snack throughout the night, she knew she could say no to herself. Just after 7am, May checked into the lab the morning of her appointment. The lab assistant behind the counter verified her name, address, and insurance information. The lab person wore a Gryffindor jacket, which somehow helped her make sure the lab received the order for the screening from May’s doctor. She told May that a phlebotomist would call her name shortly, so May and Reilly sat in the waiting area. At 7:15 a nice lady called May’s name and brought her back to a room where they draw all the blood and drink it as an elixir to prolong life. The phlebotomist — we’ll call her T — told May they need to take an initial draw to make sure her glucose levels weren’t already elevated. Once they determined the levels, May would then drink the stuff. So T poked May’s vein in the crook of her right elbow and took a small tube’s worth of blood. 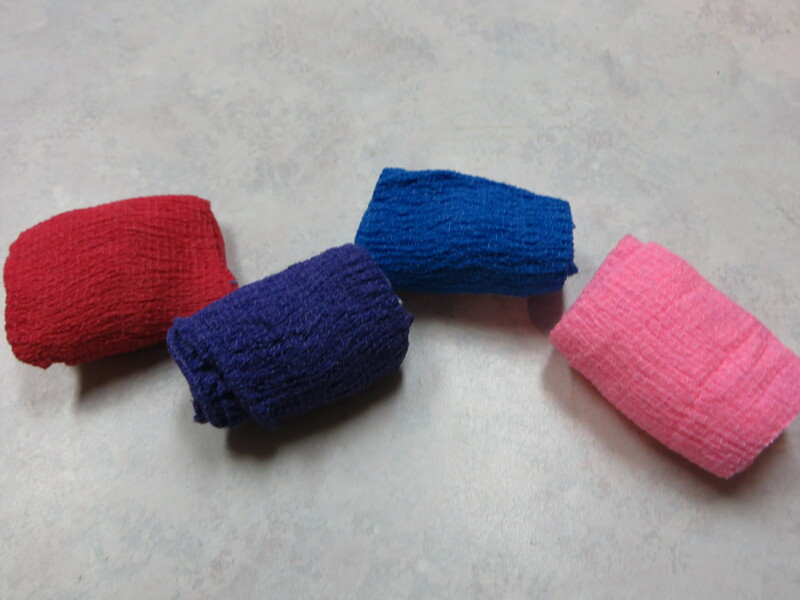 She bandaged the tiny hole-wound and wrapped her elbow with red medical stretchy cloth tape. May then went back to the waiting area. Ten minutes later T came out and told May that she “passed” and handed a small bottle of clear liquid to her. Drink the stuff within five to eight minutes (of now). You can drink water throughout the three hours, but no eating. The stuff might give you some nausea, but that will go away. If you end up vomiting, you have to do the test all over again. You can get up to use the bathroom, but don’t walk around a lot. Draw blood every hour for the next three hours. You don’t have to wait for us to come get you; you can go ahead and come back to the room when it’s time. 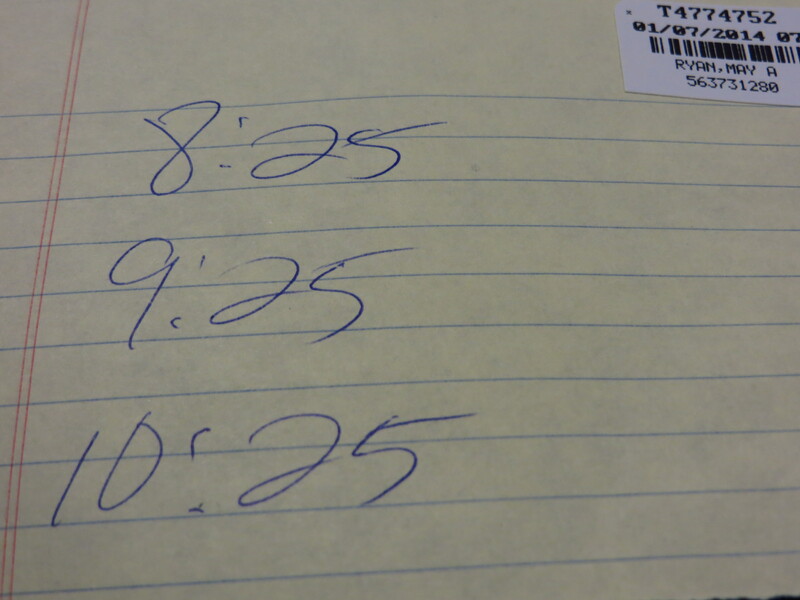 T then gave May a piece of paper with times for blood draws. T was super nice and reassuring. She asked May if she had enough water and to let her know if she needed more. Then T walked back to the blood room. May twisted the lid off the bottle of stuff. She poured some of the stuff into the small paper cup that T supplied and began drinking. She asked Reilly to take a picture during this part of the process. May did not hide her disgust. The worker at the front desk told her that the stuff would taste a little bit like Sprite, but a lot sweeter. It did have a lemon-lime flavor, but have you ever drunk anything so sweet it tasted bitter and tacked onto the roof of your mouth? Cloying is the word that comes to mind. Why was May even doing this? 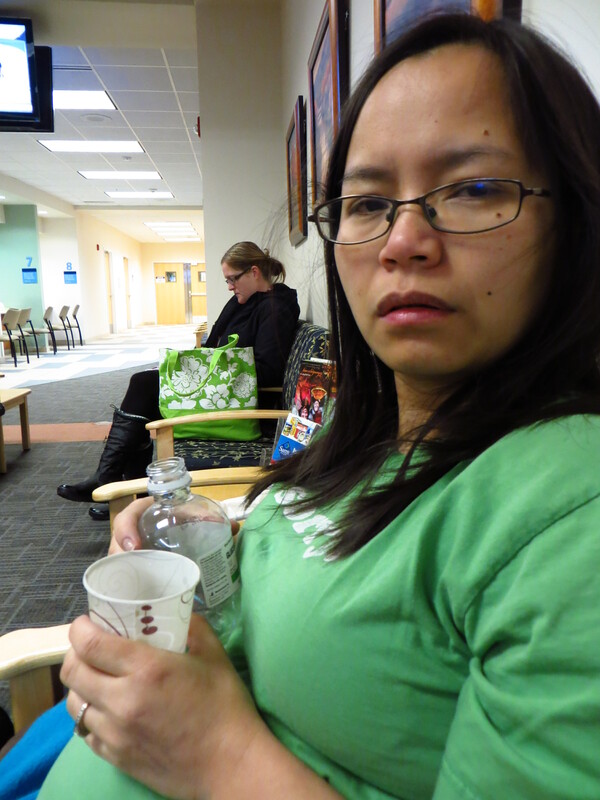 The Monday before she took a one-hour glucose screening at her doctor’s office. Similar procedure: 12-hour fast beforehand, only water during the fast, orange stuff (that made her feel woozy) instead of clear stuff, draw blood one hour later. The office called her three days later (which was later than usual because of the New Year’s Day) to tell her that glucose levels were abnormal, and that she would have to schedule the three-hour test. In the days leading to this longer test, May and Reilly read about gestational diabetes on the internet, just enough to get worked up to a moderate frenzy on the inside but managed to stay calm and cool on the outside. May also began glugging more water. She bumped up from a half gallon to three quarts each day. 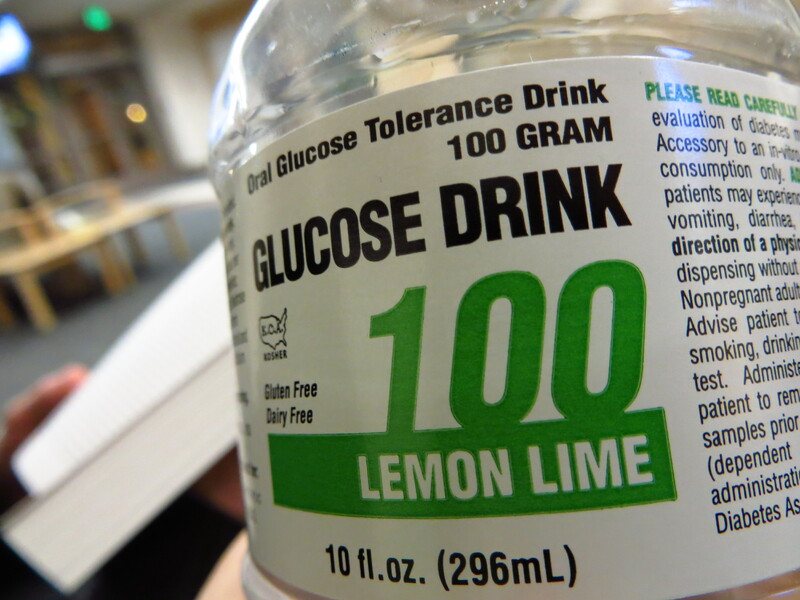 Why would her glucose levels be high? 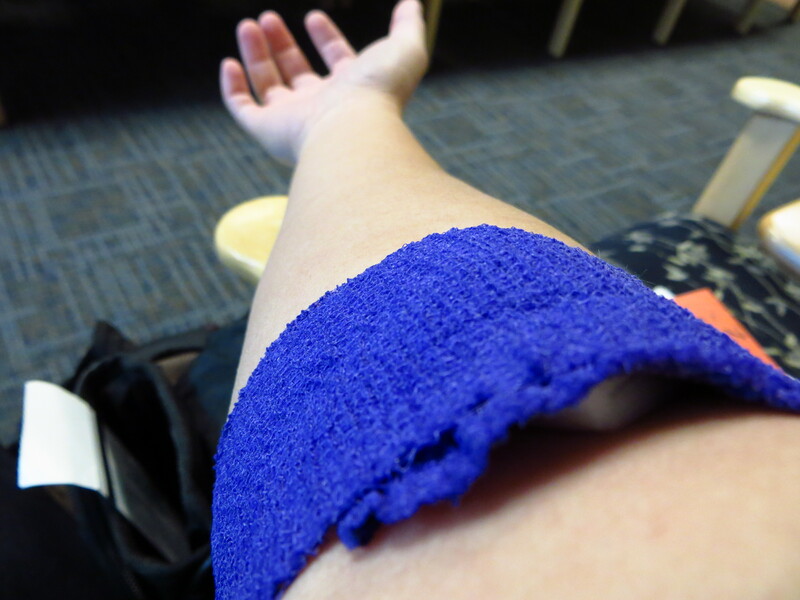 8:25 – purple; right arm, no problems because my right arm veins are trusty. 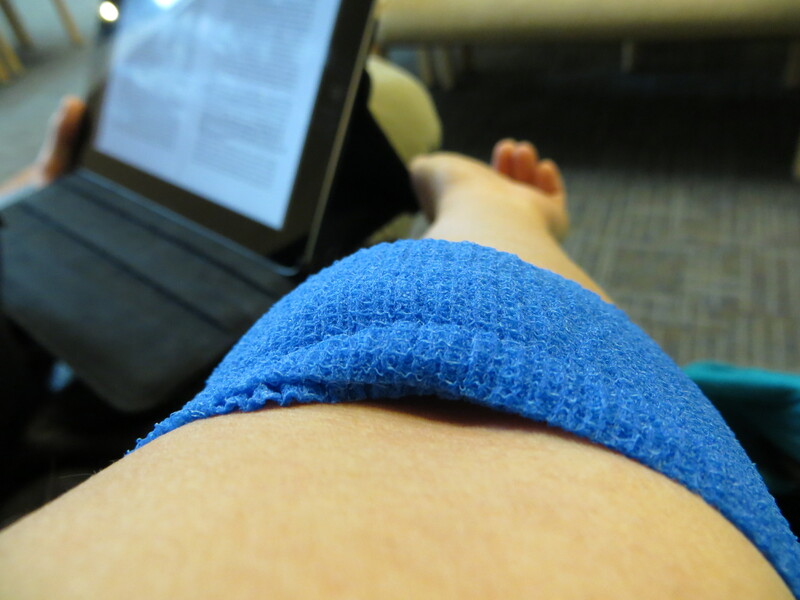 9:25 – blue; left arm, which had never been poked because the veins there aren’t as big as those in the right arm. But May didn’t want four holes in the same vein. 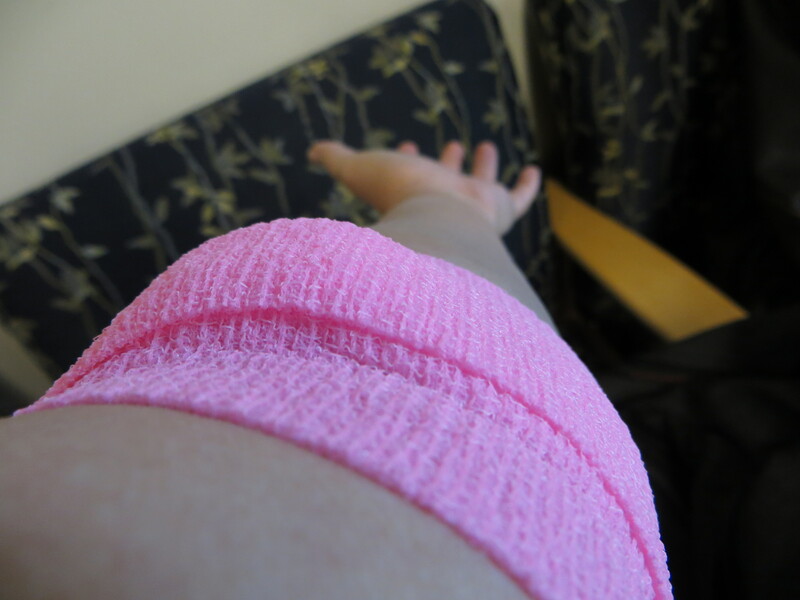 10:25 – pink; left arm. T had trouble getting the vein to shoot so she moved the needle’s tip around inside May’s arm for nearly 30 seconds until blood shot in a quick and steady stream into the tube. “Come on, vein,” she said, coaxing it. This did not hurt but was weird anyway because a needle was waving around inside May’s very own arm, and that’s just a weird thought. Each time May went back to the blood room T asked how she felt. On one of the screens in the waiting room T’s bio appeared. It said she’s been a phlebotomist for 21 years and has drawn blood over 140,000 times. Experienced and nice. And early in the morning, when it seems easier to be nice. The last time T drew May’s blood May said that the last hour of waiting was the longest. T sympathized. She also seemed pleased to learn that May would not be driving home. She said that she hoped May had a good lunch planned. May asked how soon the results would come. T said she’d send the tubes to the lab right away and have the results in a few hours, but the lab would notify the doctor’s office. So if May doesn’t hear from the doctor’s office within the next day, she should call them. May thanked T for all her help then went out to a late breakfast with Reilly. French toast, eggs, sausage. Nothing overboard, but very delicious. May really enjoyed eating after not eating for 15 hours. Which is the longest she’s gone without eating since before she became pregnant. Six! months ago. The next day May meant to call the doctor’s office at 4pm but forgot. And when she remembered the office had already closed. The day after that May told herself that she would call in the morning. When she had been at work for about an hour, she got up to use the bathroom then talked with a coworker for about five minutes. When she got back to her workstation, she saw that she had a new voicemail message. She listened to the message from the doctor’s office and returned the call. The results came back from the lab. Levels are normal. May does not have gestational diabetes. May will continue to eat well and maintain drinking three quarts of water a day and go for short walks. Nothing will really have to change. May let out a little “yippee!” on the phone and the front desk worker at the doctor’s office laughed. Sure, lots of women get gestational diabetes, and lots of those women go back to being perfectly healthy after pregnancy. May would have taken it in stride and managed just fine, but still, she and Reilly are extremely relieved. This past Sunday at church, the bishop announced from the pulpit that the son of a family in the ward was playing soccer last week and suddenly collapsed. The boy’s family took him to the hospital. The bishop said if anyone spoke Spanish in the ward, the family would appreciate a visit. Wednesday nights, I go out with the Relief Society presidency to visit women who have recently moved into the ward. We introduce ourselves to these ladies, and we welcome them to the ward and reassure them of our desire to be their friends. Tonight, while we were getting into the Relief Society president’s car to make some visits, the second counselor reminded me of the bishop’s announcement and said she received an email saying that the boy had passed away. She also said that because the family had spent so much time at the hospital looking after their son, both of the parents lost their jobs. It’s bad enough to have bills you can’t pay for, but for that to add another layer to a pile of grief and sorrow just breaks my heart. The boy was 11 years old. It’s so much harder to get through sadness without answers or explanation. But I guess that the family isn’t really thinking about getting through it right now so much as feeling it. Feeling helpless, alone, crushed. Feeling angry, lost, numb. I want to do something for the family, and going to the funeral doesn’t even seem an earnest effort at anything. Donate for the funeral or to a fund until parents can find work? Make them dinner? I want to show support. There has to be something more, something demonstrative, something that really matters. I’ll have to pray and ask for inspiration, an outlet for compassion or a way stretch out a hand; I need to see how One knows exactly what this family is feeling right now would do. Sometimes God moves loudly, as if spinning to another place like ball lightning. God is, oddly, personal; this God knows. Sometimes en route, dazzlingly or dimly, he shows an edge of himself to souls who seek him, and the people who bears those souls, marveling, know it, and see the skies carousing around them, and watch cells stream and multiply in green leaves. He does not give as the world gives; he leads invisibly over many years, or he wallops for thirty seconds at a time. He may touch a mind, too, making a loud sound, or a mind may feel the rim of his mind as he nears. Really interesting and compelling commentary on prayer and the power of God. Church leaders from many denominations can agree generally on the transforming powers of prayer. Ms. Dillard says she doesn’t know beans about God. And this comes close to the end of her book, almost 200 pages of philosophizing and observing and sincere searching. She doesn’t know beans. But, we probably know more than we think we know. And God always gives us credit for what we know. At a regional conference in the Marriott Center on Sunday, one of the speakers, Julie B. Beck, suggested that we’re doing better than we think we are, but we could also be doing better than we really are. I bet the “mechanism unknown” involves faith, if it’s not faith itself. We pray when we want perspective. We pray when we want God’s help. I needed both last night after talking on the phone with someone. Paradoxically, surrendering myself isn’t the same as giving up. It’s anti-quitting. I know I could be doing better. I just don’t know how I’m doing.